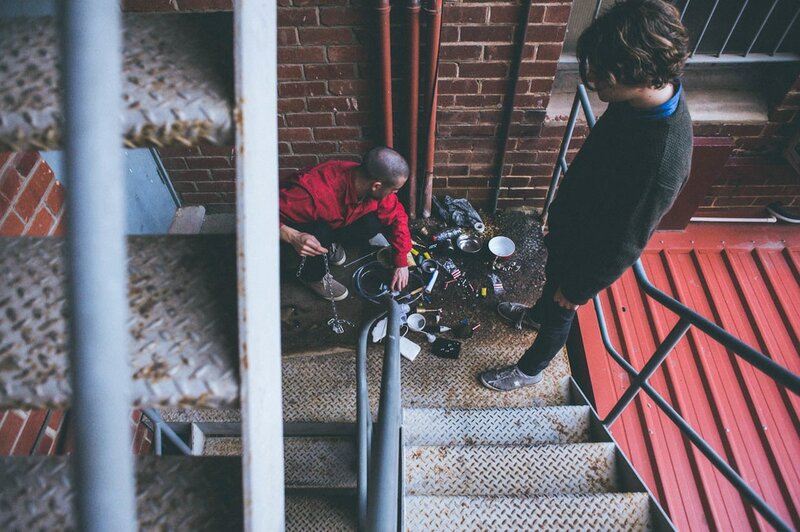 ​Tchake is the electro-acoustic improvisation duo of Melbourne drummer Michael McNab and Perth-based electronic musician Josten Myburgh. They have performed at Supersense Festival of the Ecstatic (Melbourne), Cable#8 Festival (Nantes), the Totally Huge New Music Festival (Perth) and in numerous concerts across Australia and Europe. In 2015 they made a release in collaboration with Berlin-based vibraphonist Emilio Gordoa, released on Shame File Music. In 2017, they participated in Dan O'Connor's Residence series in Perth through the Tone List label, creating recordings and performances, from which they created their debut duo release Both and Net, also including a collaboration with Jameson Feakes. Their earlier works used extensive electro-acoustic processing and dense sound design; more recently they have worked with a harsher, reductionist aesthetic, making heavy use of found object percussion, feedback systems, silence and stasis. CD release on Tone List. Recorded live during Residence #3 in Perth, Western Australia. Released as a CD-R on Shame File Music. Recorded in Berlin in Gordoa's rehearsal studio. Early demo recording made at the Spatial Information Architecture Laboratory, Melbourne.